It happens every year, in mid-March. I would turn on the radio, and hear everyone having fun in something called BERU, but couldn’t join in, because my location is a few hundred kilometers too far South. I have watched this enough times to pique my interest. “What would it be like, to actually compete in the Commonwealth Contest?” As far as THIS op is concerned, there is no longer any reason to wonder. I spent most of March, 2012, as 6Y0A, and entered the Commonwealth Contest in the 12-hour category. Josh, 6Y5WJ, and I, have discussed this possibility many times. I almost went in 2011, but a last-minute booking made it difficult. As it turns out, 2012 was my year! I bought my tickets, packed my bags, and hoped for the best. New York City is a strange place. It is very difficult to get out of town. Invariably, something “comes up” that prevents leaving. You promise yourself all Summer, that you will go to the beach next weekend, or go fishing in Montauk….but when it’s actually time to go, something prevents it. The Jamaica trip was no exception. With one week to go, prior to departure, I slipped on a Steel-lined curb, and fell on my left hip, HARD. Visions of a broken hip, of confinement to bed, of cancellation of my plans, all floated through my head. I limped away. With demands on my time right up to the night before departure, I guess I was a little surprised to find myself at the airport, about to embark upon my first real vacation in a dozen years. Josh, and his lovely wife Jenny, met right outside the terminal. We recognized each other at the same instant, Jenny brought the car ’round, and off we went! It was a longer ride than I had anticipated, but passed pleasantly…with conversation and scenery fully occupying the time. I finally allowed myself to believe that I had sucessfully gotten away from NYC! It was a good feeling. The air smelled sweet, the sunshine felt good on my skin. My smile was a grin. Then we started climbing. And climbing. (and CLIMBING!) Josh and Jenny live over 2200’ASL, with a view to die for (see photo.) The ocean in the distance is actually three miles away, but it takes well over a half-hour to get there, because no road can decend at such a steep angle. The climate is far more pleasant at 2200′, no need for air conditioning, and some nights require a sweatshirt. The breeze must keep the mosquitos away, as I didn’t get bitten once, in a 17-day stay. It wasn’t as extreme as, say, San Francisco ….but in that genre’. My game-plan was to be competitive in the 12-hour class, which is a bit more challenging than simply chasing rate. My idea was to pick the 12 hours OFF time correctly. An “OFF” period must be 60 minutes or greater in duration, but there is no minimum “ON” period. This worked both FOR me, and AGAINST me, during the contest period. I heard Nigel, ZD7XF, only once. It was on 10 metres, and it was 50 minutes into an “OFF” time. If I had called him, the QSO would have been certain, and we might even have tried 15…but when my time came, he was nowhere to be found! Nigel did, however, manage to contact over 1100 other stations during the contest. Then again, having no minimum “ON” time, allowed me to glean VK and ZL multipliers during the middle of my night, and then shut down, to save precious “ON” time for a more productive shift. I think I was on the air for 20 minutes, and off for a few hours. Martin Platt, G4XUM scored over a thousand contacts, from ZF1UM, and exceeded 10,000 points in his very first try at BERU, and he says he is “already looking forward to next year.” Bob Whelan, G3PJT/VP9 almost didn’t make it to Hamilton. Some sort of flap with the airline, but evidently he got it squared away, as he opened on time. Bob managed 760 contacts from Bermuda. Nigel, Dave. Martin, and Bob were my team-mates in this year’s Commonwealth Contest (Team Atlantic and Caribbean Islands) and I consider myself fortunate to have my 12-hour entry as an excuse for being low man on the totem pole. 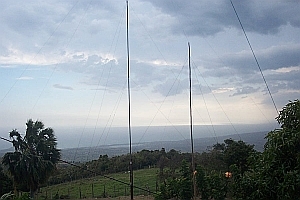 (6Y0A had just over 600 QSO’s for 12 hours operating.) Had my entry been a 24-hour effort, I would likely still end up at the bottom, but perhaps a bit closer to the pack. The N1MM software worked flawlessly, and correctly identified needed multipliers. Even with no Packetcluster, I was able to utilize the bandmap to log callsigns and dupes, as I spent 30% of my time tuning and 70% “running.” I feel it is essential to “comb out the band”, particularly before a band-change ….but that’s just me. Josh took me to Negril. I rode in a glass-bottomed boat. 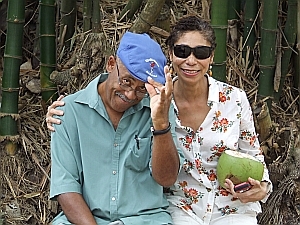 He took me to the Appleton Rum Plantation, which serves samples of all of their products at the end of the tour. We went to Mandeville, to Black River, to Kingston. I met Nadine James, who is a Licensing Representative at Jamaica’s Spectrum Management Authority. She was the one who taliked me through the application process. (If you go, allow three months for the paperwork.) In my spare time, I managed 6000 CW QSO’s that were OUTSIDE of the contest. For many years, Josh and Jenny lived in England. He still runs a highly sucessful draughting business in the West Midlands. 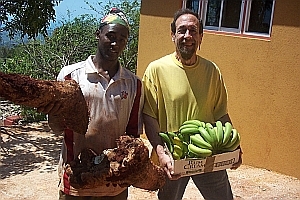 They had all of the trappings of an upper-middle-class life, but moved to Jamaica 12 years ago, and never looked back (well…..maybe once or twice….but not recently!) They love where they live, and the enthusiasm is infectious. I am already looking forward to my return next year. For more information on their operation, see the website: http://www.infochan.com/~joshwa/ They have a steady stream of visitors, so if you have a particular contest in mind, make your enquiry early. Something we all tend to forget, when we don’t get to travel far from home….is that each area has it’s own customs….it’s own traditions ….it’s own ways. In a place like Jamaica, where there is a constant stream of tourists, you are from one of two places. Either you are from Jamaica, or you are “FarIN.” You will get a lot further by showing reSPEK, than by demanding it. A smile, and the greeting WHOPPUM? will get you a long way. Having a local teach you the nuances has a tremendous influence on the quality of your experience. It seems that everyone who visits wants to return.